Discussion in 'Stock 2011 - 2019 Ford Explorer Discussion' started by cwescapexlt4x4, April 30, 2016. To show you the strength of the Explorer/Utility Interceptor ... we had a couple days of horrible dust storms in the SE Arizona/SW New Mexico region this week and this happened on Thursday 4/28/2016. AZ DPS Sgt. Shupe (thankfully) was NOT in the vehicle but he may have survived as the driver area was "intact" and yes that is the engine and trans feet away from the unit. [MENTION=231970]Arizona[/MENTION]_DPS Sgt Shupe stands next to his patrol vehicle after is was struck by an 18 wheeler. Yes that is dust! Was that on the 10 west of Buckeye? That is wild, thank god he wasn't in the vehicle. Im betting Ford wants that unit back for analysis ASAP? The Explorer didn't fair to well on the overlap crash tests...thank goodness he wasn't in the vehicle. 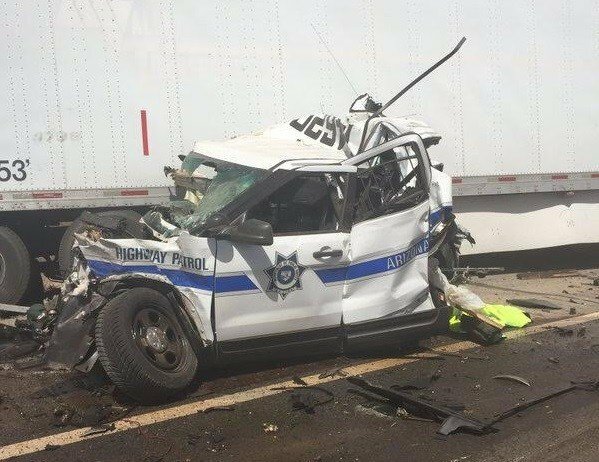 I'm going to say anything that was hit by the semi was destroyed, it was offset to the passenger side when the front hit something, if it was centered I'm sure there would be nothing left of the cab. Wouldn't really matter what vehicle it was. No, that was out towards the New Mexico area in AZ (SE AZ) on I-10 ... this section was closed again yesterday for a short time. That was one "lucky" individual. The cab held up because the cab wasn't the absorbing point of direct impact. If it was, the officer would have been road pizza. I sent those pics to the Police Vehicle Team in Dearborn, even they were amazed. the shocking part is if you look at the picture closely that shows the front of the Explorer you can see the partition behind the first row seats since the windshield is missing, I don't think it has a dash or seat remaining on the passenger side. Behind that is all crumpled metal, it was shredded like tin foil. That wavy white piece hanging off to the side near the semi is the passenger curtain air bag or roof sill? Thank God the police officer wasn't in it when it was hit. Obviously improvements have been made on the "new" Interceptors as the CVPI probably would've instantly caught on fire from a rear end collision of this magnitude. Actually, the CVPI exceeded rear end collision standards by a WIDE margin. The issue was a lot of the gear carried in the trunk of the vehicles was stored in such a way that it intruded into the fuel tank area with a rear end impact. Also, drill-happy upfitters loved to mount equipment brackets on the shelf in the trunk, often with whatever self-tapping screws they had on hand. They found that the screws put in the wrong place could penetrate the gas tank. There is a reason that Ford publishes an upfitters' guide that tells you where NOT to mount equipment, and issues guidelines on storing of other gear. ...but they also had a recall where emergency vehicles could have caps placed on the rear axle to avoid it puncturing the tank. The tank wasn't getting little pin holes from screws, it was being torn open usually by large pieces of metal. The amount of force it takes in a collision is fine but the fiery explosion that sometimes follows isn't, what use is a trunk if you have to position sharp objects away from the front of a vehicle. They should have put a bladder or a puncture proof plate around the tank. Mine has the trunk pack with the Kevlar rear lining, beats me if it helps. The problem with the CVPI is the placement of the fuel tank. The placement of the fuel tank was behind the rear axle at the rear, and not in between the front and rear. With a rear impact, a crash into the rear fuel tank was eminent. The design of the panther platform came from the 1970s and has been around since the 1970s. It's extremely old. This is why they discontinued the Crown Victoria because cars of that body style, body on frame and wide, big metal sedans aren't popular anymore except with fleets. It wouldn't be as big a deal as a civilian vehicle, but the main purpose of that car is to be used as an emergency vehicle when pulled over as a blocker on the side of the road, having it explode is not good :roll:. The Explorer pictured earlier probably couldn't do a better job unless it was a larger vehicle, it had no chance, but having it not explode in a ball of flame probably saved other people around it. The author got a couple things wrong. There was no 2012 PI Utility, they were introduced as 2013 models. The Crown Victoria ceased production in August 2011 when they closed the St Thomas Ontario plant. There are tons of stories about why the CVPI was stopped. The real reason was simple, the CVPI was older design and didn't meet the upcoming crash and roof crush standards required by government. To bring it up to todays standard was 100's of millions of dollars and you still would have had to upgrade everything else in the vehicle. So Ford decided to go with something already proven and that sedan was the Taurus. They skipped building Police vehicles for the 2012 model year. The shocks and springs are not exclusive to the PI Utility, they are shared with the retail Sport, same as the brakes, water cooled PTU, and cooling system among others.